The one-year Bucerius Master of Law and Business (LLM /MLB) is the ideal program for young professionals who strive to work at the intersection of law and business. Its graduates are equipped with an impressive set of skills and knowledge with direct relevance for work in international companies, law firms, and other organizations. They belong to a group of cutting-edge professionals who have been systematically trained to take an interdisciplinary approach to legal and management questions. Graduates of the Master of Law and Business program understand complex legal situations, grasp their economic dimensions and perform effectively in an intercultural environment. They meet the increasing demand for corporations, law firms and non-profit organizations for interdisciplinarily educated and internationally oriented young professionals. 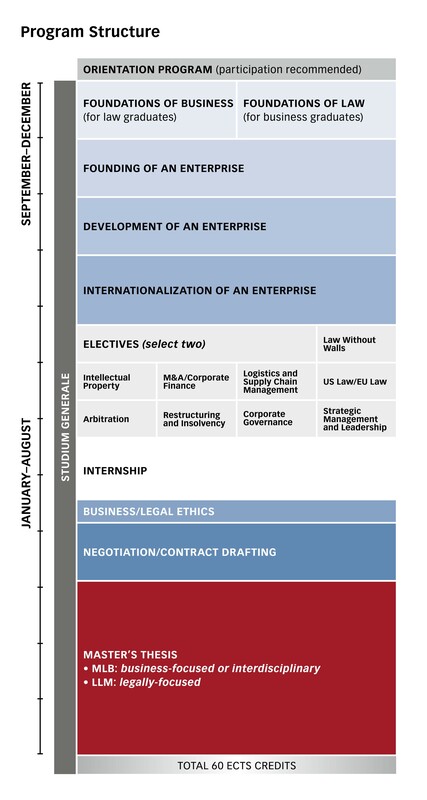 The unique curriculum of the Master of Law and Business follows the life-cycle of an enterprise and pursues both the legal and business aspects of its development. This includes the founding of the enterprise, transforming the firm into a publicly-held enterprise, going international, merging with or acquiring another firm, and restructuring a firm that has financial difficulties. By using the development of an enterprise as its structural backbone, the Master of Law and Business creates synergies among its various modules. As a result, the students study more efficiently and obtain a better overall understanding of the interrelationship of law and business. Students analyze the realization of an entrepreneurial idea, investigate the founding of a business enterprise, and evaluate the international growth and development of that enterprise. Elective modules allow students to deepen their knowledge in additional areas of law and business. A mandatory internship and writing of a master’s thesis add practice-oriented and research components to the program. Depending on the focus of their studies and their academic background, graduates are awarded either a Master of Laws (LLM ) or a Master of Law and Business (MLB). Tuition fees include all study materials.